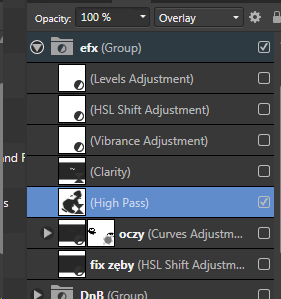 I believe this happens when you have a High Pass Live Filter Layer in the document and you then select the Paint Brush Tool and drag it around the canvas (without painting anything). The rendering tiles seem to go a different tone and remain on the screen. They shouldn't export like that—can you confirm? Hi, i will confirm that once home, but I seem to see this on export too. it's the same image as in the other bug repot, and there I was working on exported images. Confirmed, it happens on exported files too. File uploaded to the link in other topic. It definitely looks similar to the High Pass issue I logged a while back where the Paint Brush Tool would display rendering tiles. 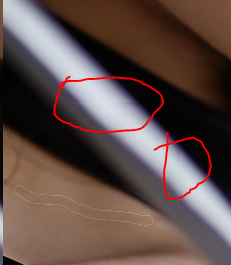 However, the Paint Brush Tool doesn't affect your document so it could be another issue entirely. Leave it with me. @chris B: I'm having similar issue with another image when using live High Pass layer. (seen on the latter snippet).